What kind of insanity is that statement? “To die is gain?” That can’t be a verse from the Bible! There has to be a mistake somewhere! The fact is, Paul had no qualms about dying. He says several times, that dying in Christ is far better than living in this ungodly world. Now of course, such a statement as that (“For me to live is Christ, and to die is gain”), would be considered pure madness by the people of the world. Well, after all, the Bible says that they are “having no hope, without God in the world”. So understandably they could never accept such an idea like Paul’s, “To die is gain”. Too bad! Such a life-philosophy which Paul had, would be a tremendous witness to this faithless world. Too bad there are not any Apostle-Paul-types these days! Well maybe there are. But it seems as if Christians are often so desperately trying to hold on to this life. But for those of us who are desperately trying to hold on to life in this world: do we really believe that there is a Heaven, in which there is no more pain nor sorrow, but love, peace, and everlasting joy? Many Christians, by tenaciously holding onto life, give evidence that perhaps they don’t. Can God take care of our children, after we’re gone? Of course He will! We don’t need to worry. God’s promises are true. Do we actually think that God would take us away, and merely leave our children to themselves? History is filled with accounts of orphaned or abandoned children who grew up to eventually become great and notable men and women. Listen… “When my father and my mother forsake me, then the LORD will take me up.” Psalm 27:10. God is a very faithful God, much more than we can imagine! Now good old King Hezekiah was just the mirror-opposite of Paul. When he found out he had a terminal illness, Hezekiah wept before God, pleading for Him to heal his terminal illness. And God answered Hezekiah’s prayer. God gave him 15 years of additional time on earth (see Isaiah 38:5). But because of that life-extension, Hezekiah later had a son, Manasseh, who would eventually become the worst and most evil king that Judah has ever had, completely undoing all the good that his father, Hezekiah, had accomplished. If only Hezekiah had trusted God enough to go, when it was his time. God knew all about the evil he would do. That is why God wished to take out Hezekiah. This story reveals a very important principle about life and death. God knows about the evil to come. Nobody dies by accident. God knows that there are worse things than death, by far! Now the advice given in today’s devotional is not for everybody. But it i s an encouragement only for those who are strong enough in faith, to allow God to decide when it is time to be taken by God. Faith is an ever-growing virtue. One can fan the flames of God’s Spirit, if one wishes to do so. Anyone who desires to become great in faith, like Paul, or John, or Peter, can do so, if they wish. PAUL RAN UP THE STEPS? There is a historical account of Paul’s day of execution. As the story goes, Paul actually ran up the steps to where his executioner was waiting! Now of course, this is merely outside information. But judging from the way that Paul conducted his life, it only makes sense that Paul would do such a thing, if for no other reason, as his last testimonial to the many onlookers who, no doubt came to watch his execution. It is easy for those of us who are healthy, to hand out well-meaning advice to those who are sick. But if the situation were reversed, then perhaps, those of us who are so fearless on behalf of others, might not be so quick to follow that very same advice we were so eager to hand out to others. Family situations, and other circumstances make these issues more complicated. And so, we cannot judge, nor can we know what is best for another individual. Only God knows for sure! This “Altar” Constellation is only seen in winter through spring, in mid-sky. It is to the south of the “Fleeing Woman Constellation” (AKA Ursa Major or The Big Dipper). 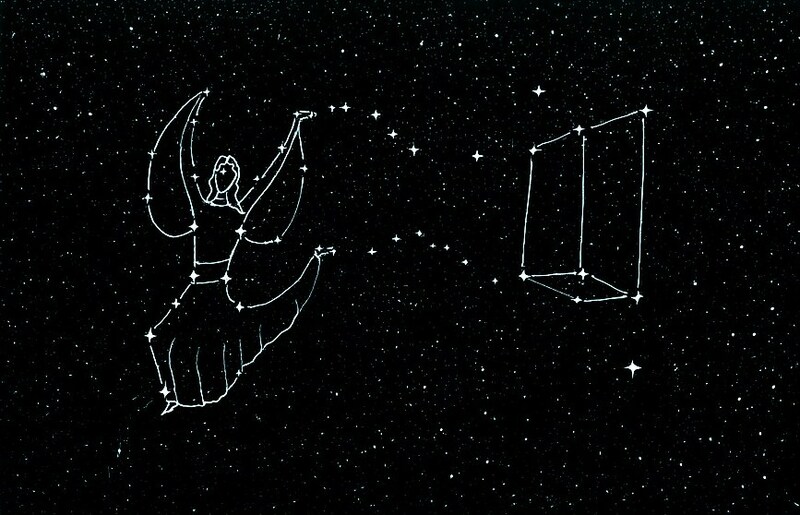 The “Fleeing Woman of Revelation 12” Constellation is in the northeastern sky in this sketch. You would be facing east and looking very high up almost to mid-sky to see this constellation group this way. The altar is farther south but still in the eastern sky. This altar is commonly known as “Leo Major“, with the smoke rising being “Leo Minor“. A little farther down this page is the sketch of this same constellation in the latter part of winter, when you look at them facing westward. You will notice that what looked like Gospel seed being cast from her left hand and left foot (see “Woman of Revelation 12-The Fleeing Woman“ article for explanation of casting “Gospel Seed”) now appears like smoke or incense rising from the altar. It is not clear why the altar is sideways in back of the Woman. It would make more sense if it were directly under the Woman. However, the Lord must have some spiritual truth to convey concerning this odd positioning of the Altar. The 7 Stars (Big Dipper) is easy to see with its very bright 7 stars. But the Revelation 12 Woman (Ursa Major) must be seen on a dark starry night, away from city lights.